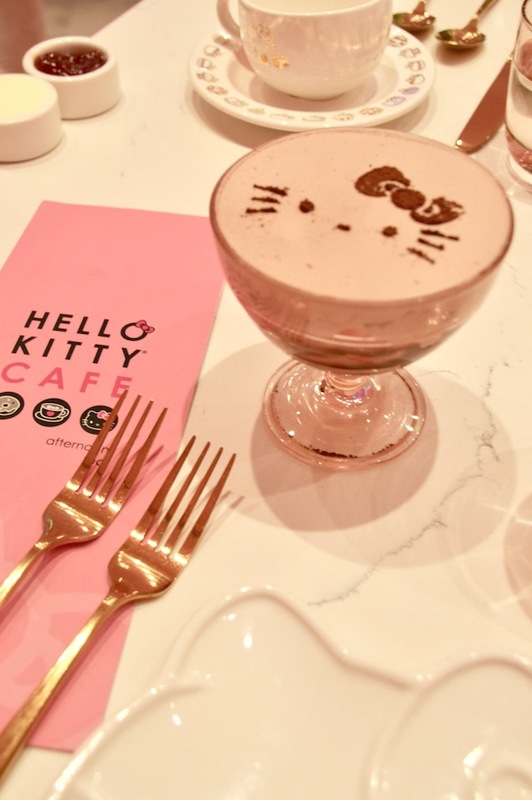 Hello Katie Girl: Hello, Hello Kitty Cafe! 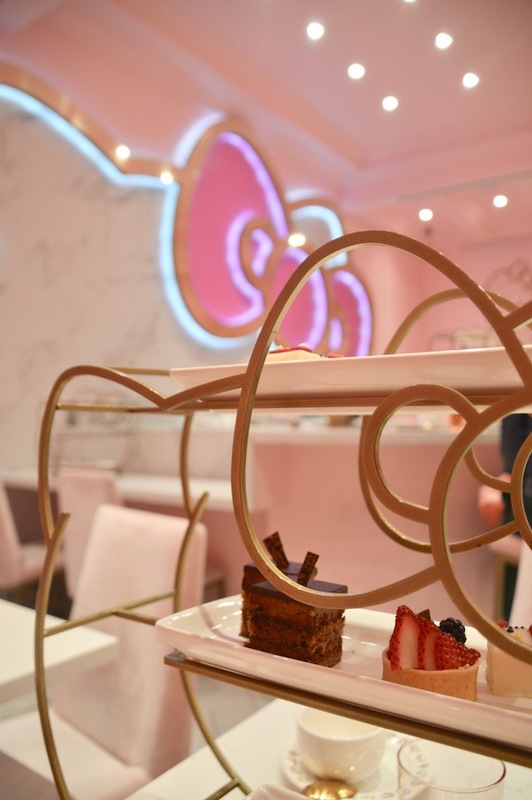 Several weeks ago, we visited the Hello Kitty Grand Cafe for tea in what's known as the cafe's "Bow Room". I suppose it is only fitting that someone whose blog is named "Hello Katie Girl" should visit the Hello Kitty Bow Room! Described on Sanrio's website as a "hidden pink oasis", the Bow Room definitely lives up to its description and is everything I could dream of and more! Although the Bow Room and practically everything in it is doused in pink, I decided to wear my new red lace dress because pink and red is one of my new favorite color combos and something that I think would be approved by Hello Kitty herself! 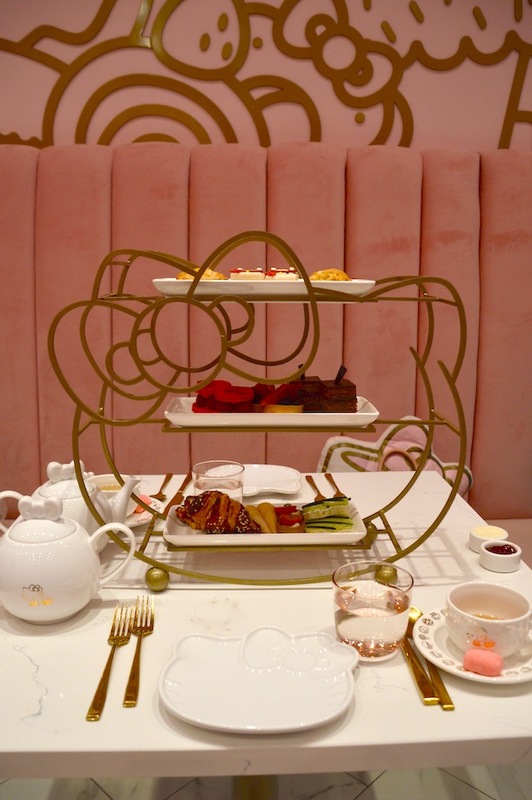 Below, you will see my photo odyssey of tea at the Hello Kitty Grand Cafe Bow Room. As I previously mentioned, it was quite an experience, both visually and in terms of the food. For $55, you will be served an assortment of tea sandwiches and cute little desserts, in addition to your choice of tea. For tea, I opted for the Birthday Cake tea, which, I was told, is one of their most popular choices. One of my favorite things about the experience and the food was that the sandwiches were served on an adorable Hello Kitty tea tray! Clearly, a lot of thought was put into all of the little details, which made the experience very special! Speaking of details, the tea service begins with strawberries in chocolate whipped cream (shown above) with Hello Kitty's visage gracing the top! It was very tasty, not to mention very sweet! 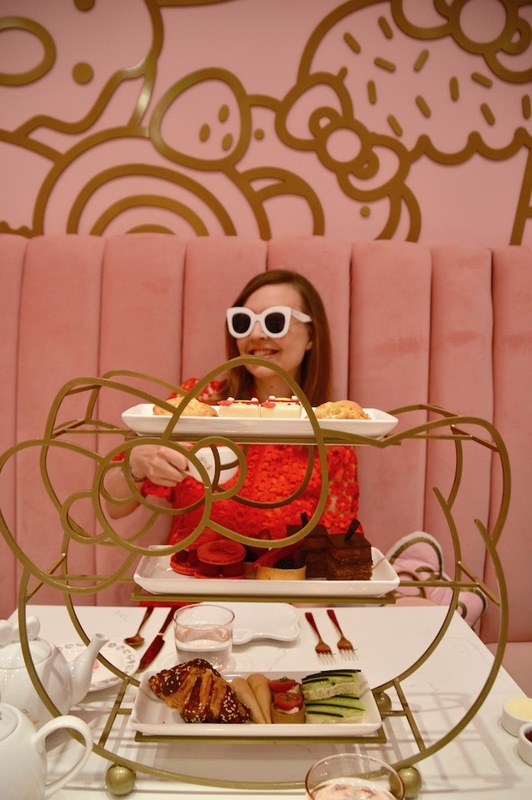 Between all of the pink and all of the sweets, tea service at the Hello Kitty Grand Cafe was a lot to digest, both visually and in terms of taste! I give my husband a lot of credit for offering to go with me and enduring all of the pink but he was a very good sport about it...and I secretly think he had fun too! 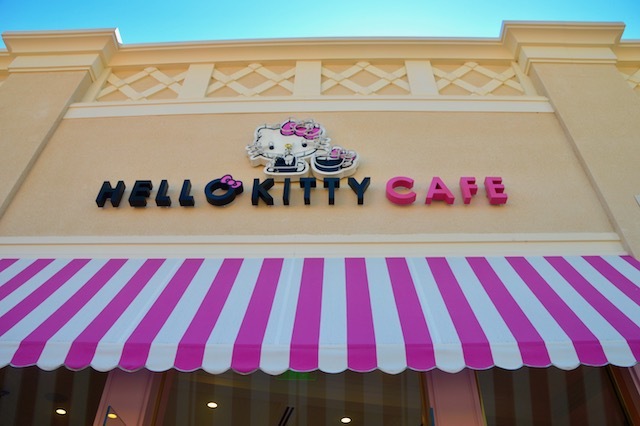 Above is Hello Kitty's gigantic pink bow that graces the cafe and gives the Bow Room its name! 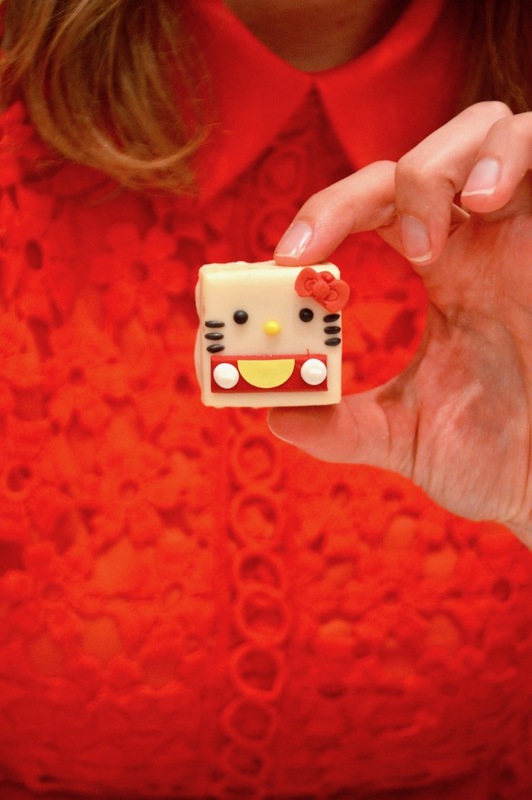 Below is a Hello Kitty themed dessert that was almost too cute to eat! 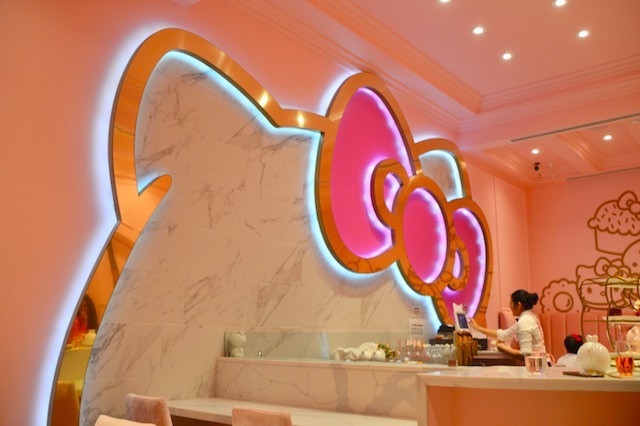 I would highly recommend visiting the Bow Room of the Hello Kitty Grand Cafe for tea! Another option is to go in the evening for cocktails, which is something I would love to eventually try as well. Located in the Irvine Spectrum in Orange County, it's a fun experience if you're in the area and makes for some adorable photos! My only suggestion is to make sure you plan ahead for the experience and get reservations early, as they tend to fill up quickly, for obvious reasons! Another quicker and cheaper option is to just grab a little snack or even a donut from the cafe. It's not the full Bow Room experience, but it's a fun taste of Hello Kitty without going overboard! Ah it looks just adorable! My girls would LOVE to go to a place like this! this is the cutest thing i've ever seen. Love your colorful shoes and I totally think this place was the perfect place for you! Thanks so much for linking up with the Sunday Showcase. Your pics always make me feel happy! This looks so fun, and kudos to your husband for engaging in the experience too!